Background: The goal of the trial was to evaluate the safety and efficacy of aspirin compared with placebo, in primary prevention, among patients at moderate risk of first cardiovascular event. Methods: This was a randomized, double-blinded, placebo-controlled trial done in multiple centers in Europe and the USA in around 12,000 patients. Patients at moderate risk of coronary heart disease were randomized (1:1) to aspirin 100 mg daily (n = 6270) versus placebo (n = 6276). The duration of follow-up was a median of 60 months. The mean patient age was 64 years with almost one-third of patients being females. The trial included males ≥55 years or females ≥60 years with at least three cardiovascular risk factors (dyslipidemia, current smoking, high blood pressure, and positive family history of cardiovascular disease [CVD]). The exclusion criteria were a history of diabetes, stroke, myocardial infarction, coronary revascularization, vascular intervention, significant arrhythmia, or congestive heart failure, history of use of antiplatelet therapy, anticoagulation therapy, or nonsteroidal anti-inflammatory drugs, and history of gastric or duodenal ulcer or gastrointestinal (GI) bleeding. The estimated baseline 10-year risk of CVD using ACC/AHA risk calculator was 17.3%. 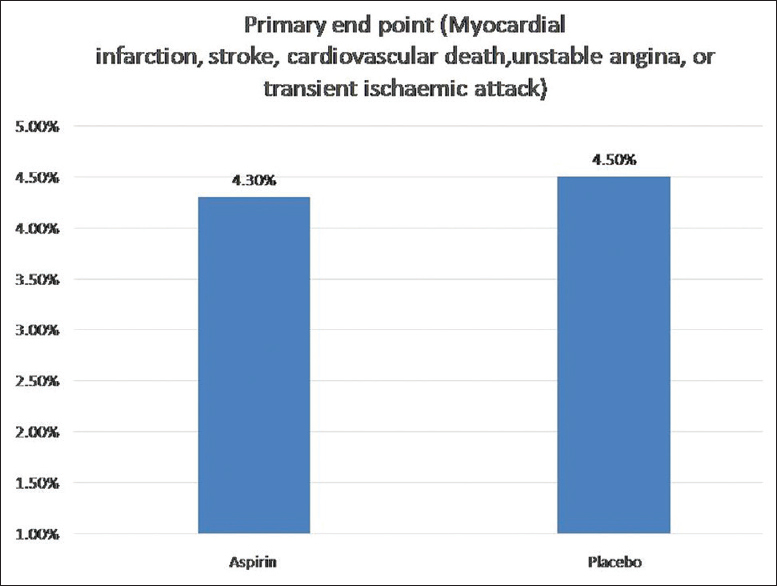 Results: The primary efficacy outcome of cardiovascular death, myocardial infarction, unstable angina, stroke, or transient ischemic attack (TIA) occurred in 4.3% of the aspirin group compared with 4.5% of the placebo group (P = 0.60). 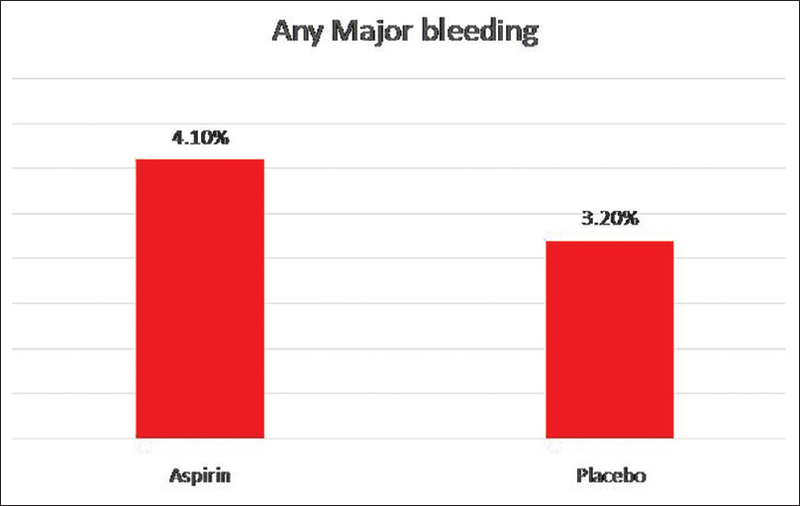 The primary safety outcome, GI bleeding, was seen in 0.97% of patients in the aspirin group versus 0.46% in the placebo group (P = 0.0007). The overall incidence of adverse events was similar in both the groups. The secondary outcomes of myocardial infarction were 1.5% with aspirin versus 1.8% with placebo (P = 0.23). The occurrence of stroke was 1.2% with aspirin versus 1.1% with placebo (P = 0.51). The actual event rate in each group, transformed to a 10-year rate, was considerably lower than expected, 8·43% in the aspirin group and 8·80% in the placebo group [Figure 1] and [Figure 2]. Conclusions: Among patients at moderate risk of coronary heart disease, the use of aspirin was not beneficial as a primary prevention strategy. Aspirin was not associated with a reduction in adverse cardiovascular events. Bleeding events were low and were similar between the groups. This trial guides us in the management of patients who are at moderate risk of atherosclerotic CVD. The use of aspirin as a primary prophylaxis strategy failed to show any significant benefits with respect to occurrence of major cardiovascular adverse outcomes. The adverse effects were also similar in both the groups; however, GI bleeding was more in the aspirin group. The use of aspirin in moderate-risk patients needs to be individualized and should be weighed against the increased risk of bleeding. Background: The goal of the trial was to evaluate low-dose aspirin compared with placebo among healthy elderly patients. Methods: This was a randomized (1:1), double-blinded, placebo-controlled clinical trial conducted in Australia and the USA. Around 19,000 healthy elderly patients were randomized, either to enteric-coated aspirin 100 mg daily (n = 9525) or placebo (n = 9589). The median patient age was 74 years and the median duration of follow-up was 4.7 years. Almost half (56%) of the participants were women and 11% of the patients had diabetes. The inclusion criteria were individuals ≥70 years of age (or ≥65 years of age for Blacks and Hispanics), and the exclusion criteria were any overt CVD or cerebrovascular disease, atrial fibrillation, history of dementia, any high risk of bleeding, and contraindication to aspirin. Results: The primary outcome of all-cause death, dementia, or physical disability was 21.5 events per 1000 person-years in the aspirin group compared with 21.2 events per 1000 person-years in the placebo group (P = 0.79). 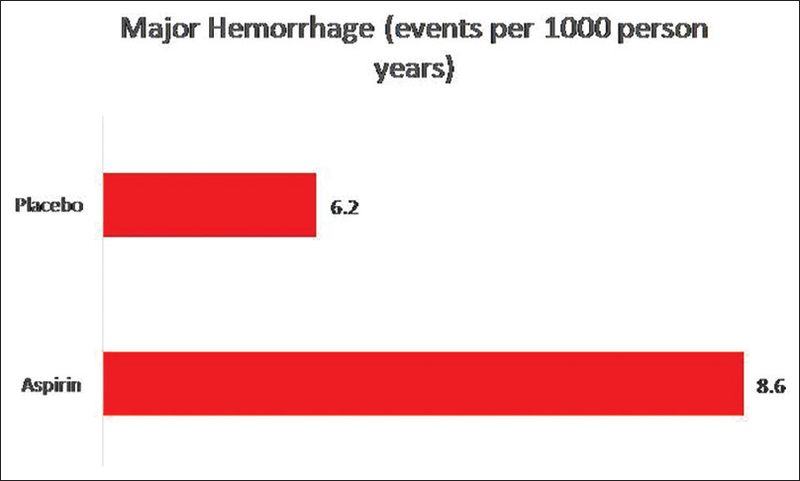 The secondary outcome of major hemorrhage was 8.6 events per 1000 person-years in the aspirin group versus 6.2 events per 1000 person-years in the placebo group (P < 0.001). The incidence of intracranial bleeding was 2.5 events per 1000 person-years in the aspirin group versus 1.7 events per 1000 person-years in the placebo group (P < 0.05) while that of upper GI bleeding was 2.1 events per 1000 person-years in the aspirin group and 1.1 events per 1000 person-years in the placebo group (P < 0.05). The incidence of CVD (fatal CVD, myocardial infarction, stroke, or hospitalization for heart failure) was 10.7 events per 1000 person-years in the aspirin group versus 11.3 events per 1000 person-years in the placebo group (P = 0.95). All-cause mortality was 5.9% in the aspirin group versus 5.2% in the placebo group (P < 0.05) [Figure 3] and [Figure 4]. Conclusions: Among healthy elderly patients, low-dose aspirin therapy was not beneficial. 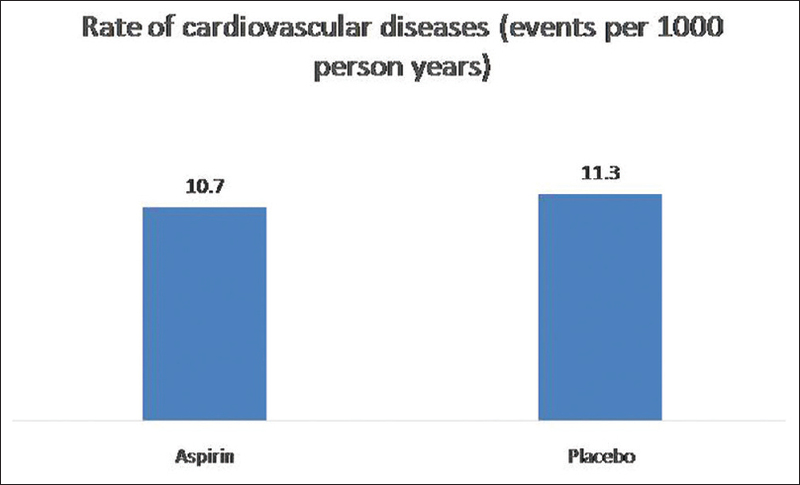 Compared with placebo, aspirin did not improve disability-free survival or reduce major adverse cardiovascular events at a median of 4.7 years. This trial aimed to study the effects of aspirin as a primary prophylaxis strategy in healthy elderly population. Contrary to the anticipated results as were seen in the previous trials, the use of aspirin did not show any benefit with respect to major cardiovascular adverse outcomes. However, it was associated with a statistically significant increase in major bleeding, which was attributed to excess intracranial and upper GI bleeding. Importantly, 25% of the patients in both the arms were on proton pump therapy in this trial. Aspirin was also associated with an increase in all-cause mortality, which was attributed to excess cancer mortality in the aspirin arm. This trial clearly establishes that aspirin does not have a role in primary prevention in the healthy elderly population, and on the contrary, it poses the risk of significant major bleeding. Background: Diabetes is associated with increased risk of cardiovascular events. The goal of the trial was to evaluate the role of aspirin among diabetics with no known CVD. Methods: Diabetic patients (any type), ≥40 years of age, without known CVD were included in the study. The exclusion criteria were a clear indication or contraindication to aspirin. In this randomized (1:1), double-blinded, placebo-controlled trial, around 15,000 patients were randomized, to either aspirin 100 mg daily (n = 7740) or to placebo (n = 7740). The mean duration of follow-up was 7.4 years, the mean patient age was 63 years, and 37% were women. Results: The primary efficacy outcome of major adverse cardiovascular events (vascular death, myocardial infarction, or stroke/TIA) occurred in 8.5% of the aspirin group patients compared to 9.6% of the placebo group patients (P = 0.01). The primary safety outcome of major bleeding (intracranial hemorrhage, GI hemorrhage, or sight-threatening eye-bleeding) occurred in 4.1% of the aspirin group compared with 3.2% of the placebo group (P = 0.003). The reduction in adverse events or an increase in bleeding events was similar among different categories of baseline risk. The secondary outcomes were incidence of nonfatal myocardial infarction in 2.5% with aspirin versus 2.5% with placebo (P = 0.98), incidence of intracranial hemorrhage in 0.7% with aspirin versus 0.6% with placebo (P = 1.22), incidence of GI hemorrhage in 1.8% with aspirin versus 1.3% with placebo (P < 0.05), and incidence of GI cancer in 2.0% with aspirin versus 2.0% with placebo (P = 0.99) [Figure 5], [Figure 6], [Figure 7]. Conclusions: Among diabetic patients with no known CVD, aspirin was associated with a 12% relative reduction in major adverse cardiovascular events compared with placebo. 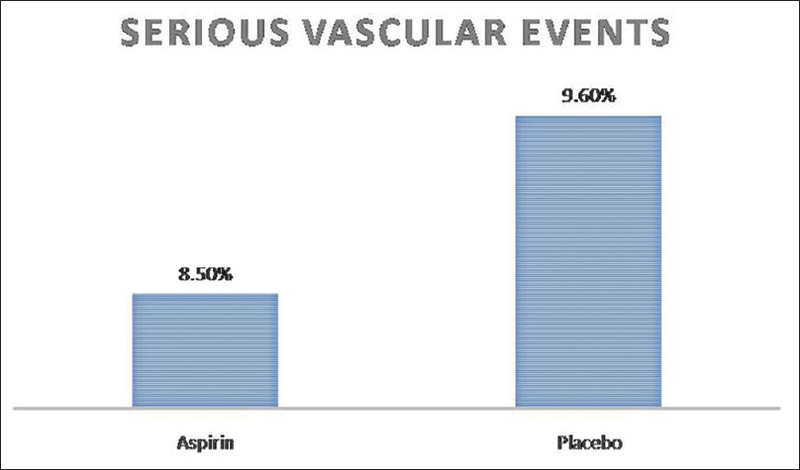 However, aspirin was associated with a 29% relative increase in major bleeding events compared with placebo. 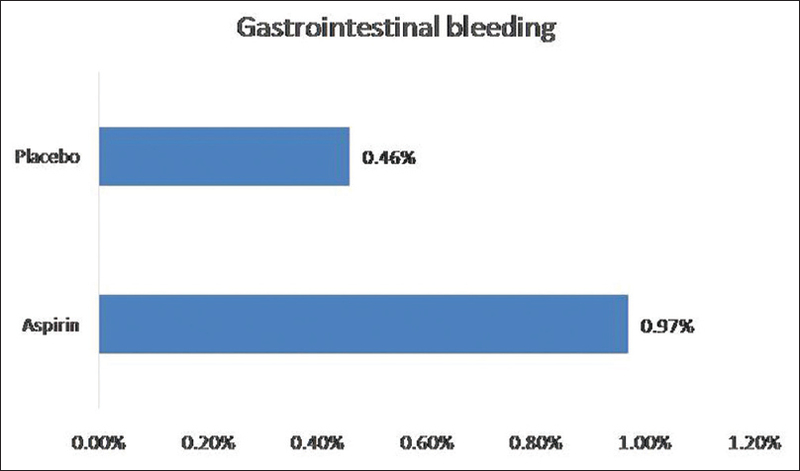 The increase in bleeding was mainly due to GI hemorrhage. The absolute risk reduction for major adverse cardiovascular events was 1.1%, while the absolute risk increase for major bleeding was 0.9%. 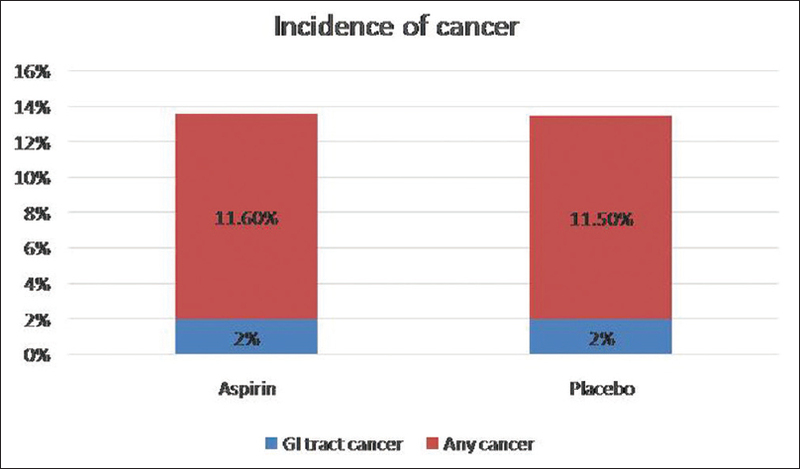 There was no reduction in GI cancer from the use of aspirin. This trial was intended to study the effects of aspirin as a primary prophylaxis strategy in healthy diabetic patients. The trial did show a significant benefit in the aspirin group for the occurrence of major cardiovascular outcomes. However, this benefit was achieved at the cost of even more quantum of significant increase in major bleeding in the aspirin group. The most important source of bleeding in the aspirin group was GI tract. Only quarter of the patients in trial were receiving proton pump inhibitors. The major criticism of the trial is that if all patients would have been on proton pump inhibitor therapy, GI bleed could have been lower in the aspirin group. Aspirin has shown to decrease the incidence of cancer, in particular, GI cancer, in several meta-analyses. However, this trial did not show any reduction of cancer in aspirin arm. The use of aspirin did not decrease the incidence of GI cancers as well. Therefore, the evidence from this trial suggests that beneficial use of aspirin in primary prophylaxis for diabetic patients should be weighed against the significantly increased risk of bleeding. Should We Use Aspirin for Primary Prevention of Cardiovascular Disease in 2018? Aspirin has been the cornerstone of the treatment in secondary prophylaxis of cardiovascular events (myocardial infarction, stroke, TIA, etc.,) and the consensus to use aspirin for life in these events is without any ambiguity. However, aspirin also carries a risk of bleeding which has been found in many studies. Hence, whether to use aspirin for primary prophylaxis of CVD has always been a debatable issue. Many large primary prevention trials (Physicians' Health Study and the Women's Health Study) showed benefits in cardiovascular events in high-risk patients but at the cost of an increased risk of bleeding. Using aspirin as primary prophylaxis in diabetic patients is very common and is almost an unwritten rule in many parts of the world. Most of the primary prevention trials showing benefit in favor of aspirin were conducted at a time when reduction of other risk factors such as smoking cessation, blood pressure control, and aggressive lipid lowering was rare in medical practice. Therefore, we need contemporary data on aspirin so as to evaluate the benefits of aspirin against the harmful effects of bleeding. Three landmark primary prevention trials on aspirin were published in 2018 which can guide our practice for years to come. The three trials published this year and discussed above had one thing in common – the effect of aspirin as primary prophylaxis in the prevention of CVDs – and the incidence of bleeding as a major adverse effect was studied in all the three. Among all the three trials, only the ASCEND trial showed a significant reduction of major adverse cardiovascular outcomes to the tune of 12%, This benefit, however, was achieved at the cost of a 29% increase in the rate of major bleeding events. The other two trials – ARRIVE and ASPREE – failed to show any significant improvement in major cardiovascular outcomes and were also associated with an increased risk of bleeding in the aspirin arm. There was no significant benefit demonstrated in all-cause mortality too. Given the excellent efficacy and safety demonstrated with the use of statins and the results of these large scale randomized trials, in modern era, aggressive lifestyle modification with appropriate statin therapy should be the prescription for primary prophylaxis and the use of aspirin for primary prophylaxis should be discouraged.